Welcome to the Meije, one of the most beautiful places in the Netherlands, in the Green Heart, 30 minutes from Amsterdam. Great for cycling and walking. Our comfortable guest suite with two floors in the outbuilding in the garden offers a living room, bedroom and private terrace. The living room has a comfortable sofa, TV, coffee maker, kettle, oven and mini fridge. The bathroom on the ground floor has a shower, toilet and sink. In the bedroom on the first floor you can sleep in a comfortable bed of 1.80 m by 2.20 m. We offer tasty ingredients with which you can make breakfast at the moment that suits you best. Enjoy! 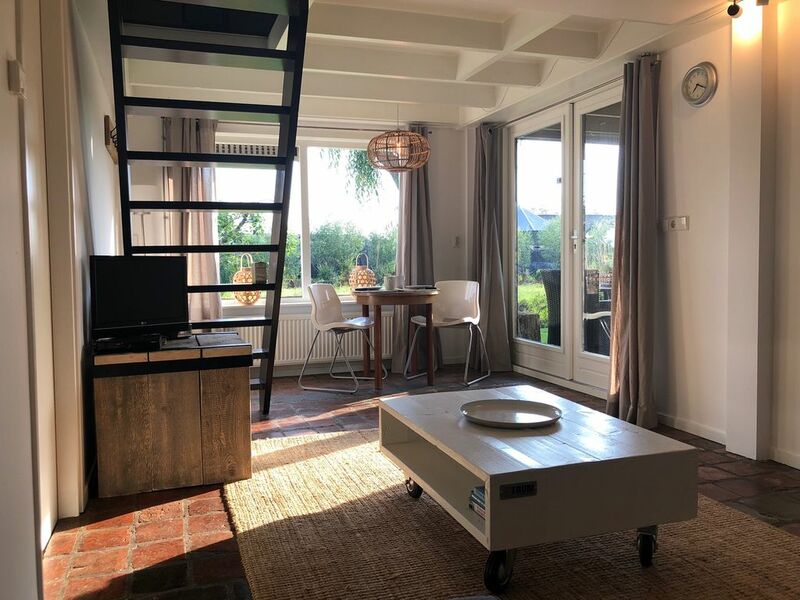 The comfortable suite with lots of privacy is located on one of the most beautiful walking, cycling and motorcycle routes in the Netherlands with a panoramic view of the Meijepolders. Less than a kilometer away you will find a restaurant and the walking path Meije next to the lakes of Nieuwkoop. Amsterdam, Schiphol, The Hague, Utrecht and Rotterdam are 30 minutes away. The Amsterdam RAI, Jaarbeurs Utrecht and the Keukenhof are also easily accessible. We have 2 city bikes available (1 men and 1 ladies bike). A public bus from station Woerden or Bodegraven stops four times a day in De Meije at 1 km walking distance. Parking is possible on private property. We have a covered motorbike parking. We are a working couple, so we get up early on weekdays. We love meeting new people and are happy to share all the information we can to make your stay as pleasant as possible. If you arrive after 22:00, you can open the guest suite with the key from the key safe (it is then not necessary to knock on the door). Hi, We are Paul and Rose and live in the Green Heart of the Netherlands. We travel very much ourselves and therefore enjoy meeting other travelers through HomeAway. Our most beautiful destination was the salt flat at Uyuni in Bolivia, our favorite cities are Amsterdam and Rome and the most beautiful meeting with animals was a baby gorilla in Uganda. On our wish list is a self-drive in Mongolia. We enjoy receiving people from all over the world and sharing our piece of paradise. Comfort! Stay in the Dutch countryside, with its cows, meadows and lakes. Visit the 4 big cities, Keukenhof in springtime or stay with us on a business trip. In the bathroom you will find a shower, toilet and sink. Kleine, liebevoll eingerichtete Wohnung mit allem was man braucht. Die Organisation und Versorgung war perfekt und Rose und Paul haben uns auch mit Ausflugtips versorgt. Der Blick aus dem Fenster beim Frühstück ist herrlich. Leider war der Aufenthalt zu kurz. Wenn wir wieder mal in der Region Urlaub machen, kommen wir gerne wieder. Within one kilometer, a restaurant and the Meije walking path is located next to the Nieuwkoop lakes. Amsterdam, Schiphol Airport, The Hague, Utrecht and Rotterdam are a 30-minute drive away. Amsterdam RAI, Jaarbeurs Utrecht and Keukenhof are easily accessible by car.